Idaho Fish and Game is fired up about increasing elk populations in its Lolo Elk Zone in the headwaters of the Clearwater River. Through a cooperative effort with Forest Service and the Rocky Mountain Elk Foundation, the two agencies and RMEF are proposing controlled forest fires known as “prescribed-fire treatments” to improve habitat for elk and other wildlife. Much of the areas where big game animals are present in the fall were either totally unscathed or burned in a mosaic pattern that left patches of forage and cover. The bigger problem facing biologists will be how to prepare for the transition to winter range after the hunts are over. Much of the WMA that is traditionally used by deer and elk to overwinter was hit extremely hard by the fires. August 31 is the last day for hunters to purchase a second general season elk tag at a discounted price. Through August only, resident and nonresident hunters can buy remaining nonresident general season elk tags to be used as second tags for the discounted price of $299 (plus $1.75 vendor fee). Starting September 1, nonresident elk tags will be available as second tags at the regular price of $416. Second deer tags are also available but will not be discounted due to high demand. The price for a second deer tag is $300.00 (plus $1.75 vendor fee) while supplies last. Big Game Season is Upon Us! 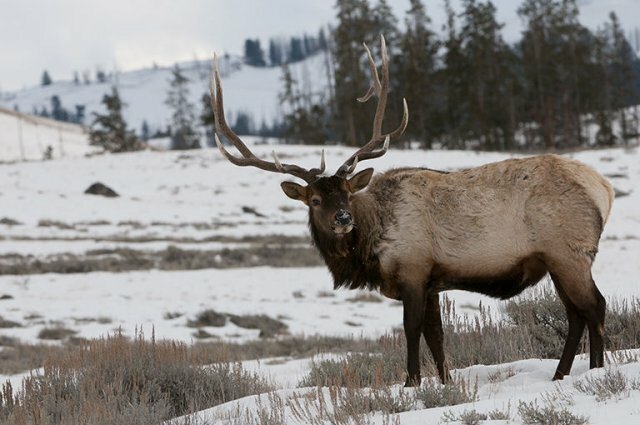 After several mild winters in a row, this winter is starting to look a little more "old fashioned" with ample snow in the mountains and frosty temperatures in the valleys, but most big game animals around the state are doing fine so far.